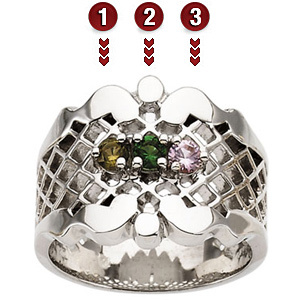 The sterling silver Family Quilt mother's ring features three simulated 2.75mm round gemstones of your choice. Import. I loved this ring when I got it three years ago, and my sister always loved it, so I ordered her one for her Birthday. It beautiful, unusual, I wear it every day and still get comments on how beautiful it is. Thank you so much.